Law at the End of the Day: Session Announcement at ESIL Research Forum: "International Law on Sustainable Development, Climate Change and Environmental Protection in Times of Disorder and Contestation"
Session Announcement at ESIL Research Forum: "International Law on Sustainable Development, Climate Change and Environmental Protection in Times of Disorder and Contestation"
to be held 28 February to 2 March at the Hebrew University of Jerusalem. 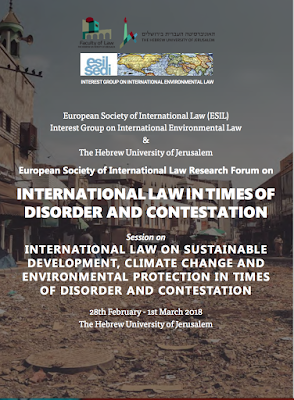 I take this opportunity to highlight a session that may be of interest: International Law on Sustainable Development, Climate Change and Environmental Protection in Times of Disorder and Contestation. It will be held on 28 February 2018 at the Hebrew University. 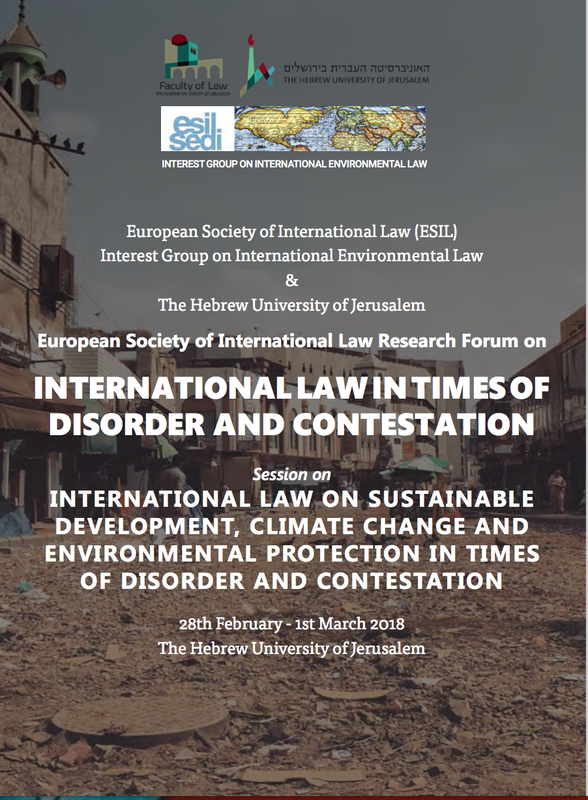 International Law on Sustainable Development, Climate Change and Environmental Protection in Times of Disorder and Contestation. The world community has acknowledged that climate change represents an urgent and potentially irreversible threat to human societies and the planet. The need for an effective, urgent and global response has been emphasised by both the Paris Agreement and the 2030 Agenda for Sustainable Development. The widest possible cooperation of all countries is essential for successfully reducing global greenhouse gas emissions. Countries are also encouraged to cooperate in the implementation of respective climate adaptation measures, especially in terms of enhancing the resiliency of developing countries and regions vulnerable to the adverse effects of climate change. In addition, climate action can significantly contribute to the achieving of the UN Sustainable Development Goals, in particular to ensure universal access to affordable, reliable and modern energy. The UNEP has also recognized the security implications of climate change for fragile regions potentially leading to social tensions, upheavals and instability. The UN High Commissioner for Refugees estimates that, on average, 22.5 million people have been displaced by climate or weather-related events each year since 2008. International law has enormous potential to address the aforementioned challenges related to climate change, sustainable development, and environmental protection, since global and ambitious actions, based on international cooperation, are required. Although the 2030 Agenda for Sustainable Development and the Paris Agreement are considered landmark achievements, their potential may be undermined by the current crisis of the traditional international law system. Raising distrust towards multilateral governance among states is represented by contestation of universal values, anti-institutional and isolationist sentiments around the world. Various stakeholders are of the opinion that international law does not keep pace with global changes, as well as changes within society. Global governance is blamed for its inability to address current challenges. Against the background of the current backlash against global governance, the IG on International Environmental Law seeks to discuss the role of international law in pursuing the 2030 Agenda for Sustainable Development. International law has the potential to cope with various global challenges, including sustainable development, climate change and environmental protection and may rebuild trust to multilateral governance. There is an undisputed momentum for sustainable development and climate change which should be maintained, in good times and even more in times of disorder and contestation. Beyond the most recent achievements of the Paris Agreement and the 2030 Agenda for Sustainable Development, the international community is already equipped with several instruments to keep advancing and implementing actions towards sustainable development, the protection of the environment, the fight against climate change and ultimately the respect of the basic human rights, that are at stake when the Earth is in danger. States have an obligation to take positive and incremental measures to safeguard the right to a clean and healthy environment. Moreover, States have a duty to prevent severe environmental pollution that could put human life and health in danger, to implement reparatory actions that might resolve past harm. Furthermore, States should not omit to act, should adopt precautionary measures and should cooperate to prevent violations of human rights. The prevention of negative effects to human life and health caused by climate change is certainly part of this State’s obligation, even more in times when these risks are dramatically accentuating. This session will be held, in its entirety, on the 28th of February. Welcoming Address by Paolo Davide Farah, West Virginia University (USA) and gLAWcal – Global Law Initiatives for Sustainable Development (UK) and Martin Svec , Tel Aviv University (Israel) gLAWcal – Global Law Initiative for Sustainable Development (UK). • Kishor DERE (Jawaharlal Nehru University, New Delhi, India): Sustainable Development 1987-2017: Ambiguity or Clarity? Both attendants and panelists have to complete the registration procedure; however, panelists commentators and chairs are exempt from registration fees.